The aerospace sector experiences rapid alterations due to the ever-changing nature of technology. This sector is not only difficult to enter and commence business in but is also loaded with unlimited opportunities. We pride ourselves on being trusted to serve the world’s leading OEMs in aerospace. 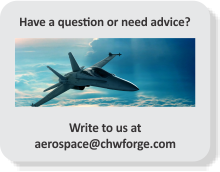 CHW has a vast experience in ring rolling a variety of materials including aluminium alloys and steel in all sizes needed to support the latest generation of aero engines with best quality and delivery records.